In my humble opinion, and admittedly I did at one time subscribe to the ladders…..how quickly I learned that they are scamming the people who cannot afford to be scammed…..it’s funny how that always seems to be the case. 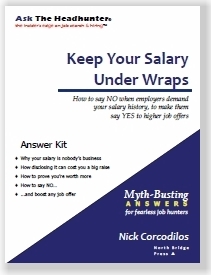 In my extended unemployment (by choice…but now not by design…) I found Nick Corcodilos to be honest…does what he says, and more…and is reasonable in terms of price for those things that he charges for. Everyone has to eat….if you climb “the ladders”, thinking that the best fruit lies near the top, you already have fallen and hit your head…..
After having my resume critiqued by the ladders and receiving the same exact letter my husband did from his resume critique, i decided to have a second opinion. I ended up hiring Debbie at fishbowlresume. Not only did she take the time to actually review my resume, but she charged MUCH less and was much more personable to deal with. My husband was so impressed with my new resume he ordered one for himself as well. Since using my new resume I am getting more calls and interviews. I can’t say that the same wouldnt have happened with the ladders, but I was not willing to pay that price for a company which as a whole has horrible reviews and sends everyone the exact same resume critique. I dont think they even looked at my resume before reviewing it, to be honest. I recommend debbie and fishbowlresume to everyone who needs a stand out resume! I am a current writer for The Ladders. Yes, they do charge very high prices and, if the client is lucky, he or she will be assigned to a writer who truly cares about the client and not just about throwing together some poorly written bit of fluff in order to move on to the next assignment. However – customers will find that with any resume writing service – – and a nod to Winston Groom – – – but Resume Writers are like a box of chocolates. You never know who you’re gonna get. I, for one, take great pride in going above and beyond to help the client assigned to me. I love what I do, and I’m very good at it. As for the critiques, yes, most are canned responses. This is because the majority of resumes out there display the same issues. I have seen many times, however, a Ladders’ evaluator who is honest and replies that the client’s current resume looks fine and is not in need of a rewrite. Before The Ladders, I worked for another company that shall remain nameless; suffice it to say that I didn’t last very long there. They required their writers to ensure the properties of the final document displayed their company name in case the client tried the old resubmit-for-another-critique-and-see-what-they-say scenario. That protocol was inappropriate and dishonest, and I left. While I was there, I was also assigned, on numerous occasions, resumes that were obviously already very well written or already written by a professional, which made it extremely difficult for the writer. Not only that, this company’s leadership left much to be desired. The Ladders doesn’t scam anyone. No one’s holding a gun to the client’s head after the evaluation, demanding their VISA number. Shop your original resume around for different critiques or, better yet, read up on the latest trends in the industry and then compare to the critiques. Time and again, I’ve had a client come back with feedback from their headhunter who said they needed an objective or to put everything back into bulleted line items. I always want to tell them that the Nineties called and they want their archaic resume back. The Ladders’ management insists their writers take courses regularly as well in order to stay abreast of current trends in the industry. They are very customer-centric to the point where I can say they are more customer-based than writer-advocate. …and they must be doing something right or there wouldn’t be blogs with people complaining and bashing them in an effort to highlight their own companies and services; not understanding the intricacies involved in composing a well-written, eye-catching resume. Wow, “Anonymous Contributor”, you certainly are a staunch advocate for your employer. That’s true. The customers that go to The Ladders are the ones that are so naive and in the dark about resume writing that they go to the service with the biggest advertising budget. I get that. It’s not your fault they are suckers. I’ll stick with the intelligent consumers — I like working with them a lot better anyway. As a consumer, one counts on the fact that effective advertising should in fact also reveal the quality of the product. So when I see commentary such as the following: “I get that. It’s not your fault they are suckers.” being dribbled about, I question the writers ability to judge anything….I utilized their services…I got a re-written resume, and in fact it was fairly well written, it just didn’t produce the results I had hoped for….I bet the original author of the quoted segment has also been subject to a purchase due to advertising….such as wedding or engagement rings or dresses, other clothing etc….how many times have they ever purchased something (with their visa card nonetheless) that they were not happy with? Everyone has, at some time or another made an ill decided purchase….as P.T. Barnum said, there is a sucker born every minute….that would include you Jennifer. I know you really either don’t care of won’t believe me, but “sucker” is one of the few terms that cannot be used to describe me. You could call me “nonconformist”, “cynic”, “skeptic”, or maybe even “contemptuous”, and even though most people may consider those terms negative, I will proudly wear those labels. That saying used to really annoy me, but now as an educated consumer and a very skeptical adult, I get it and I love him for it! I learned as a child that if it’s too good to be true, it probably is. Trust and respect must be earned, not spontaneous. 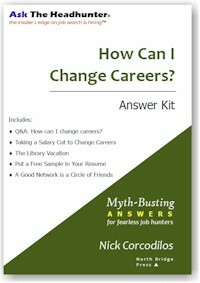 No matter what you’re shopping for — whether it’s a TV or a professional resume writer — you should ALWAYS ask questions. — How long has the company been in business? — What do their customers say about them? — Do they have references? I do not advocate going into anything blindly especially when it concerns your career! I don’t care how many fancy buttons, images, or flash gizmos are displayed on the website either. That stuff should make you more skeptical. Whatever the investment is, you should always do your due diligence. If you don’t, and you feel scammed or taken advantage of, it’s your own fault. First, you are correct, there are many resume writers claiming to be professionals. However, saying that “resume writers are like a box of chocolates, you never know what you are going to get” is true only if a person doesn’t do their due diligence. With a box of chocolates, you get pieces of candy with fancy designs, but absolutely no way to tell what is contained within the chocolate coating. So, you have to investigate. 4. You can buy chocolate that has a complete description of what you are buying on the package so you can make an informed decision. Frankly, I think option 4, combined with option 2 is how consumers, whether they are buying a car or retaining the services of a resume writer, should approach their purchases. 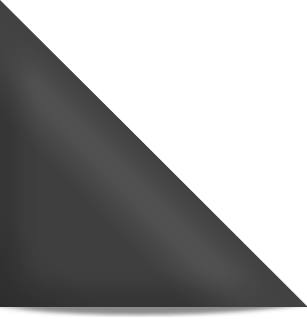 There are many things that differentiate resume writers. Level of service provided (personal consult, IMHO, is always better than having a job seeker fill out a form without any human contact), experience not only in resume writing, but hiring candidates, credible certifications earned by the writer, and a commitment to continuing education. Further, they surround themselves with a “board of directors” within the employment industry, including recruiters and HR Managers to ensure they keep abreast of trends. 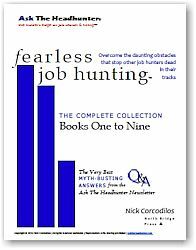 As for other resume writers “bashing” The Ladders to “highlight their own companies,” I am going to disagree with you. The Ladders model of writing canned critiques and producing poorly composed resumes has put them in a position of garnering criticism. However, unless you actually speak to the potential client, assess his / her goals, and determine the most effective strategy to help the candidate win interviews, backed up by solid experience and knowledge, there is no way to know the best way to present that client to a potential employer. Great resume writers aren’t inexpensive. Neither is The Ladders. Job seekers beware – make sure you know the name and credentials of the person writing your resume before you hand over your credit card number. Do your research, make inquiry calls, and Google the person’s name and their company name. Are they quoted by the media as an expert? Do they have clients complaining about them or complimenting them? Knowledge is power – make an informed decision before hiring anyone to perform a service. I understand that people are pushing their resume services here, however, it has to be said that theresumechick, or Karen Flowers, the first person posting above, is a scam service. She charges $50 to copy and paste information you provide her into another resume, and then stops responding to emails asking for a second draft or explanation. Kudos to the rest of you for providing a decent service…it’s scams like theresumechick that give mom & pop resume rewriters likeyourselves a bad name. How much time/effort would you put into something for $50? Resume writing is something that requires a lot of time and a lot of effort and expecting something drastic from a $50 investment seems unrealistic to me — especially when it comes to your entire career. Again, I’m not defending Karen. I don’t even know Karen…I’m just pointing out what’s obvious to me. She may be a scammer, but she might just be someone who offers something that’s worth $50. Here’s an example of something that happened to me. I let a friend try to bleach my hair once because I was being cheap. After I bought the supplies, I spent maybe $10-$12 total. We had to bleach it FOUR times and then it still looked banana yellow and my skin was damaged. It was awful! Well, a few years later, I wanted my hair bleached again so I dropped $90 for a bleach job at the salon to avoid what had happened before. And guess what? It was done right. The first time. And in only 30 minutes. I tipped her an extra $20 because I was so grateful! Anyway, to mirror what Kathy said, you should make an informed decision before hiring ANYONE to perform a service, no matter what it is (a resume service, an electrician, a dentist, a lawyer, whatever). You can be cheap when it comes to tee shirts, but when it comes to the things that have an influence on your quality of life, I don’t suggest shopping for the cheapest price. Live and learn right? At least you didn’t lose hundreds of dollars! We’re not here pushing our services. I do know Kathy and I know me and we are very passionate about what we do. We come here to inform and educate consumers. 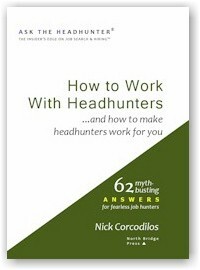 I don’t always agree with Nick (Ask the Headhunter) but I have been following him for several years because he offers a really great point of view that comes from a lot of experience. We (the resume writers) don’t always comment on the other blog topics, but we are here reading and learning and we take opportunities to share what we know when we can. And we don’t always agree either! However, what we do agree on is that we don’t like the business practices that The Ladders uses so we come here and comment on that as much as possible because it brings us all down and tarnishes the resume writing / career coaching industry. I’ve never made a single sale here and that’s not why I’m here. I’m here defending what we (the “mom & pop” writers) do each day. Nearly all of what you assert happens to be supprisingly accurate and that makes me ponder why I hadn’t looked at this with this light before. Your piece truly did turn the light on for me as far as this specific subject matter goes. Nevertheless at this time there is one particular point I am not necessarily too comfy with so whilst I try to reconcile that with the actual core theme of your position, permit me observe what all the rest of the subscribers have to say.Nicely done.